Do you find comfort in certain old things?I don't mean tattered old rags or stuff that's been around so long they've lost their shelf life. I mean, those things that have worn well and now are so comfortable you look forward to their consolation and pleasure ... cozy old sweaters that hug you, easy chairs that embrace you, or old slippers perfectly shaped to your weary feet, not to mention old books that fall open to comforting passages, cheering you like old friends. What about old familiar carols? 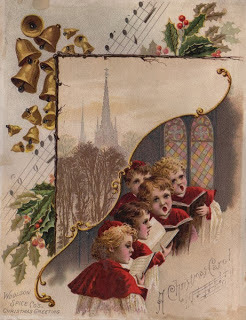 I love Christmas carols and look forward to hearing them again and again. Many of them I never set out to memorize, but because I've heard all my life---I was about three or four or five when I first learned Away in a Manger---they just became a part of me, easily and with little effort on my part. I never know when snippets and snatches will bubble up to the surface...it doesn't have to be just in December. These sweet or haunting or cheering melodies with their age old lines that tell the Story of a night so long long ago, when angels visited earth and something miraculous happened in the back of someone's barn... they are a key part in what makes Christmas special for me. I never grow tired of them. I love the comfort and nostalgia of old fashioned Christmas cookies! Guess what I did today:)? I smiled because my 'just married' daughter came home to begin her first Christmas with 'our' recipes. I enjoy traditions and rituals. Christmas carols are number one in both cases for me. When I hum or sing, Silent Night, I get goose bumps. It's such a comfortable feeling and takes me back to years gone by. Yes, Brenda, I love the old traditions that we first knew as children. Especially Away in a manger. Dear Brenda - I know what you mean about those well-worn items...I have a cozy green robe that is still so warm but has seen better days. Love "The First Noel" best and "Silent Night". Have a lovely week-end. Oh yes. Those songs rise to the top when I'm out and about, or puttering away here at home. O Come, O Come Immanuel is one that's simmered recently.